Not all applications lend themselves to the current popularity of internet-based applications. Smaller, or more private, in-office processes are often better served by stand-alone applications that are protected within the confines of a business's internal network and thus not accessible by the outside world. Despite the advances in internet technology, stand-alone applications still typically provide a more flexible, controllable, faster and robust user experience. Our custom applications make use of and improve upon existing and readily-available technologies. This approach allows for the easy modificiation and enhancement of the custom application as the needs of the business grows and/or changes. 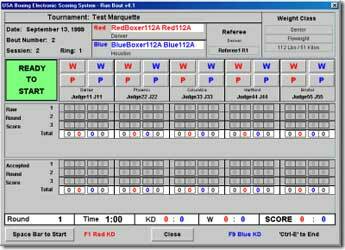 As the national governing body recognized by the United States Olympic Committee, USA Boxing is responsible for the administration, development and promotion of amateur Olympic-style boxing in the United States. 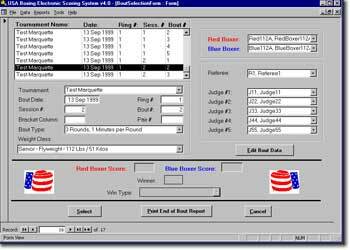 In May 1999, Gallaware was hired to write an electronic scoring system for USA Boxing. 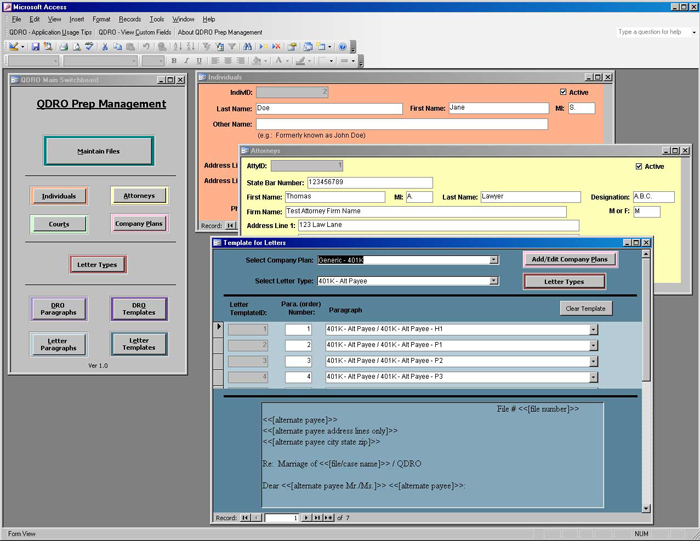 For years, the organization used a DOS version of the system and finally decided they needed to bring the application into the realm of modern computing. We proposed to develop the application using Java and MS Access which would support the Federation's requirement of a PC-based system that was easy to update and maintain. Sun Microsystems was so impressed by the effort that they put our success story on their Java web site - they believed it to be a good example, in a long list of examples, of the power and flexibility of the Java language. Therapeutic Comprehensive Services is a private practice organization that offers therapy and consulting services to patients & residents in skilled nursing facilities, assisted living centers, and outpatient rehabilitation clinics. 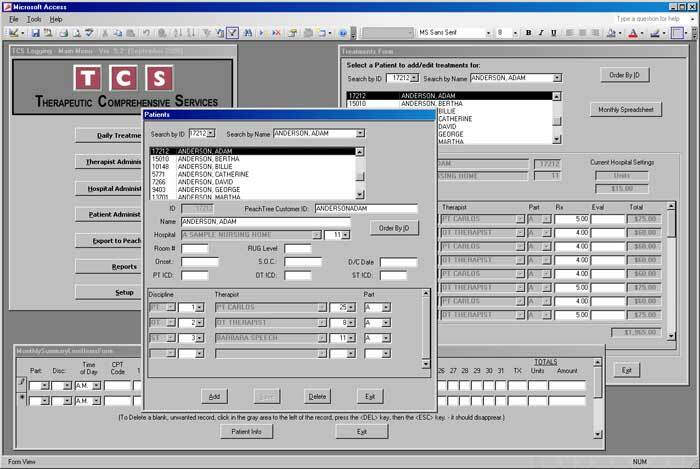 After limping along for far too long with a hardware-specific, DOS-based database application, Therapeutic Comprehensive Services (TCS) contracted Gallaware in late 2002 to completely re-design and develop a therapy logging and hospital invoicing system. 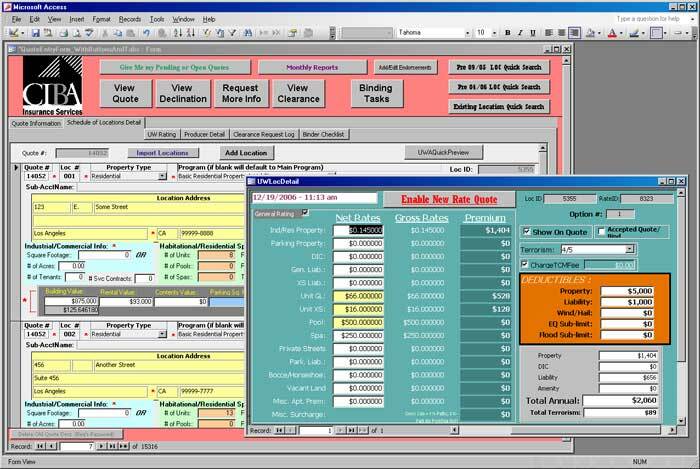 This system had to be able to track hospitals, therapists, patients and their treatments, generate invoices based on fee schedules and/or unit pricing, and export the appropriate data into their (PeachTree) accounting system (which previously had to be double-entered manually). By using MS Access, follow-on enhancements to the application can be easily implemented, and upgrading office computers no longer required reciprocal software changes. A Qualified Domestic Relations Order (QDRO) lays out how to divide divorcing parties’ retirement benefits according to court order. After years of juggling multiple paper and Word .doc copies of all communications with his clients, as well as the resulting Domestic Relations Orders (DRO), Gallaware was hired to design and develop an application to aid the attorney with consolidating and maintaining current data on individuals (whether Petitioner or Respondent), the opposing Attorneys, presiding state or county Courts, the pertinent Retirement Plans and the associated DROs. Strict court filing formats had to be adhered to for the printed DRO's and the application had to be generic enough, yet flexible enough to require the least amount of "tweaking" by the attorney for each case. As a commercial real estate insurance services provider, CIBA Insurance Services offers property owners and managers unique, innovative, comprehensive and competitively priced programs for risk coverage and claims management. As one of Gallaware's largest and oldest clients, CIBA has tasked us with developing and/or upgrading many of the database applications that are used to run their day-to-day business operations. They chose MS Access due to it's breadth of capability and the ease with which one of their own employees could make basic (and even sometimes complex) application changes. 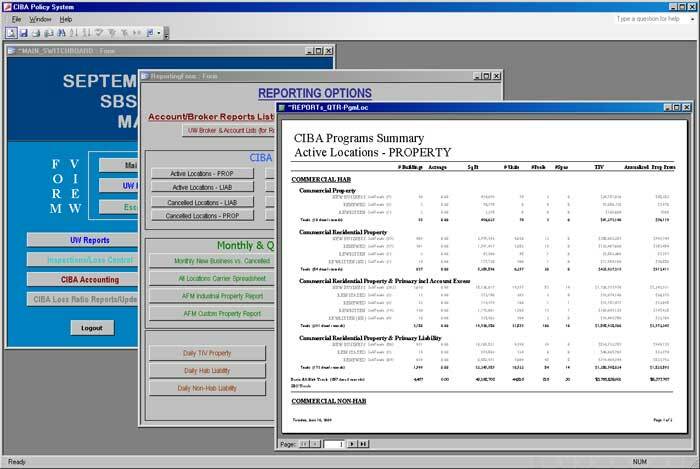 One of the first projects we worked for CIBA was to consolidate 54 distinct Certificate of Insurance reports, each originally requiring separate quarterly updates, into one report dynamically generated with content based on the data it covered. This significantly reduced the follow-on maintenance cost of the report(s). Another large project we were tasked with was to over-haul their insurance policy tracking/invoicing system to reduce the amount of time/effort they spent each Renewal season generating and printing Certificates of Insurance and Invoices. We were able to reduce this time from close to one week down to about 6 hrs. 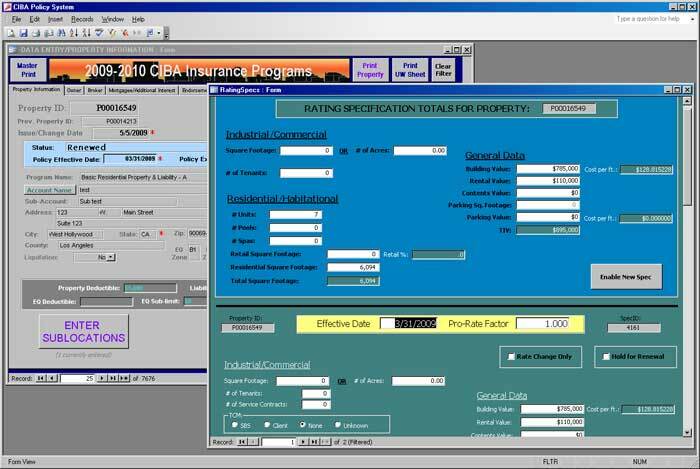 The insurance policy tracking/invoicing system(s) that Gallaware maintains and continuously enhances for CIBA do much more than just manage insurance policies and generate invoices. 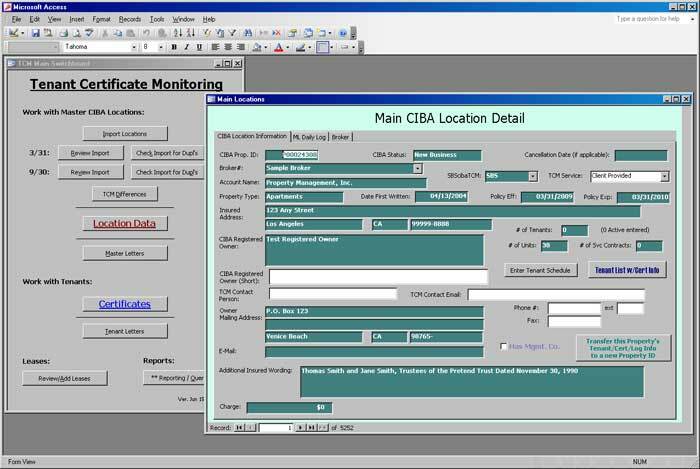 They include an extensive array of reporting capabilities for locations, accounts, mortgagees, brokers, underwriters, etc., that allow CIBA to easily stay organized and on top of their business activities so that they can spend more time analyzing how to expand and improve the services they provide. One of the first steps in getting insurance is to get Quotes from various companies. Gallaware has helped CIBA put together a comprehensive system of generating detailed insurance quotes offering various options based on the specifics of property(s) and type of coverage(s) being sought. We were also able to provide them with the ability to import location data provided by outside brokers in spreadsheet format so that the information doesn't have to be entered into the Quoting system by hand. A special service that CIBA provides to it's insured (and is also now offering to non-clients) is the management of others' Certificates of Insurance. For property owners/managers that have numerous tenants, unit owners and/or services contracts, keeping track of whether each is properly maintaining the required insurance can be a chore. Gallaware developed a concise and easy-to-use database-driven application that maintains client lease and insurance coverage requirements, provides notification when the next owner/tenant contact should be made and regarding what, and generates letters and reports to registered owners and tenants regarding these requirements. Just as Quoting is one of the first phases of the insurance process, Claims is one of the "last". 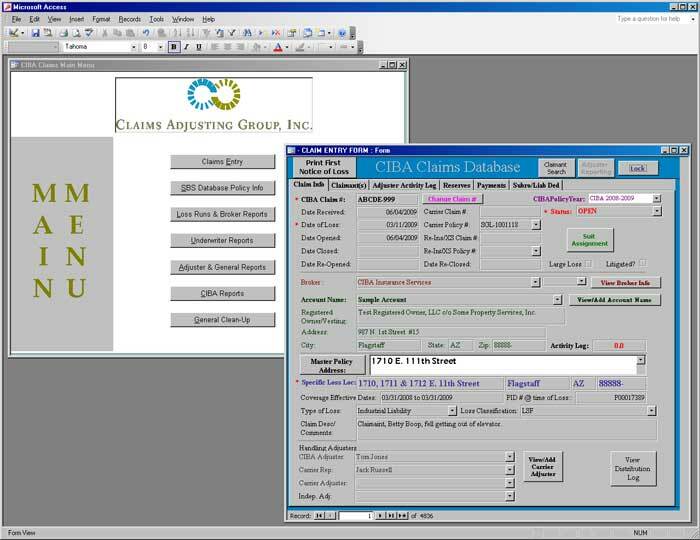 Yet another CIBA application supported by Gallaware is their claims management system. No one likes to have to make an insurance claim, but this application helps CIBA's clients by maintaining up-to-date and detailed information for the most accurate and timely claims resolution possible. It also helps CIBA by generating a wide range of reports that aid them in tracking losses based on a number of criteria so that they can continuously and properly adjust their coverages for the benefit of all. * NOTE: Much of the data included in the above screens has been modified to protect the privacy of our clients and/or their clients.